The goal of NissanPatrolUSA.com is to be a concurrent buyer and seller resource. For potential buyers, Patrol seekers and 4WD enthusiasts we seek to be the ultimate resource for finding Nissan Patrols for sale in the United States. For the most part this includes classic 1st and 2nd generation Patrol vehicles made during the 1950s, 60s and 70s, including the popular 1969 model year. 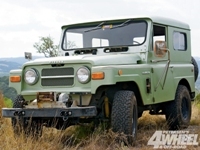 These resemble the older Willy Jeep and CJ Wranglers as well as Toyota FJ40s; and are often sought after by off-road aficionados as well as 4 wheeler collectors. As you will find in our classifieds though, we also display more modern third, fourth, fifth and sixth generation Nissan Patrols that are for sale in the USA and Canada. For sellers in and outside of North America we are also a 100% FREE resource for listing your used Patrol for sale along with any parts, accessories, restoration materials or other related items. If you are the seller of a Patrol regardless of the year or location check out our Ad Submission page. Please note though, while posting your Nissan Patrol SUV, parts or other item for sale on this site is a great idea as you will gain access to buyers looking specifically for a Nissan Patrols, we also recommend that you post an ad with your local Craigslist or Gumtree city as well as on eBay if you wish. By doing this you will gain a broader audience of 4X4 enthusiasts that may simply be looking for an off road vehicle. While NissanPatrolUSA.com is designed to be the ultimate online resource for finding Nissan Patrol vehicles For Sale; this site, its owners, advertisers or licensors are not directly involved in the physical sale of anything. This website is also not endorsed by or affiliated with Nissan nor is it certified by Craigslist, eBay or other classifieds resources. The use of trademarks and brand names are completed in line with the “Fair Use” clause of The US Copyright Act of 1976. As this site is educational in nature, use of copyrighted material is allowed. All rights to trademarks are reserved by their respective owners. Please view our DMCA Notice for more information about material presented on this website.